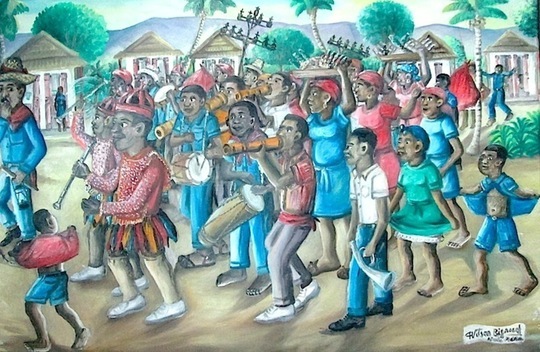 Wilson Bigaud is considered one of the great masters of Haitian art. Born in 1931, he began his painting under the direction of Hector Hyppolite when he was only fifteen years old. A golden light and warm colors characterized his early works. He is most well known for his mural, Marriage at Cana, painted between 1950 and 1951 for the Holy Trinity Cathedral. Between 1957 and 1961, Bigaud suffered a series of nervous breakdowns. He stopped painting for quite a long while. He is represented in the permanent collection of the Museum of Modern Art in New York.